Some jobs are inherently dangerous and such is the case when working for the oil and gasoline industry due to the need to work with volatile and hazardous substances on a consistent basis. Many of the things that could go wrong are completely out of the hands of workers and while preventing accidents is important, so is preparing for the inevitable. Should employees be harmed or killed in an accident, they and their families have the right to receive worker’s compensation benefits and if a reckless act or violation of safety mandates is at the heart of the accident, the victims’ employer may be held accountable for much more. 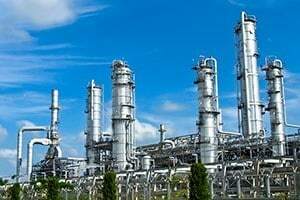 Those working for oil and gas refineries are completely aware of the risks associated with their occupations but that does not absolve employers of responsibility whenever something happens to go awry. The types of accidents and risks to gas and oil refinery workers include the following. Ignition of flammable material— because the material being processed and transported in and out of refineries is so volatile, any spark or small flame can threaten every worker on the premises. Explosions don’t merely threaten employees, but they pose the risk of sending toxic vapors into the air which can reach residents to devastating effect. Electrical fires— when not contained, an electrical fire poses serious risk of disaster, notwithstanding the harm that can be wrought upon those in the immediate vicinity of the fire. Second and third degree burns can require surgical intervention for complete recovery and victims may die of burns or smoke inhalation before being brought to safety. Chemical exposure— there are numerous ways in which chemical exposure can prove to be problematic. Corrosive chemicals can cause serious burns to the skin and other deadly chemicals can kill workers who inhale vapors without respirators. Exposure to silica— over time, silica exposure can lead to medical conditions such as silicosis and cancer if the victim is exposed over an extended period of time. Equipment failures or defects— when equipment doesn’t perform as intended, it may result in accidents or a chain reaction of events that results in a more serious event. For this reason, equipment and machines need to be inspected on a regular basis for signs of defect or wear and tear. Falling objects— incidents involving falling objects are one of the more common forms of workplace accidents regardless of occupation or location and gas and oil refinery workers must be cautious of objects that could fall on top of them and wear helmets and other mandated protective equipment to prevent or reduce the severity of injuries. Regardless of who is at fault for an accident, workers who are injured are entitled to worker’s compensation benefits, but a qualified attorney can help protect your interests when filing a claim. In addition, an investigation into the cause of your injuries can reveal negligence on part of your employer or that defective machinery or equipment contributed to the severity of your injuries. If this is the case, you may be entitled to additional compensation to supplement your worker’s compensation claim and recover the full cost of your medical bills, rehabilitative therapy, lost wages, out of pocket expenses and pain and suffering. If you lost a loved one as a result of a workplace accident, you may be able to file a lawsuit for wrongful death in order to recover compensation for your loved one’s financial contributions to your family as well as the emotional trauma of losing an important family member. Contact the Rosenfeld Injury Lawyers LLC right now to learn more about your rights and legal options during a free consultation with one of our experienced workers compensation lawyers. After thoroughly evaluating your case, we will let you know what you can expect from any legal action and help you to secure every bit of compensation to which you are entitled. If we fail to recover damages for you, then our services will be rendered at no cost.